The Bornean orangutan is currently listed as endangered by the IUCN. Only 10-15% of the total population lives in forests that are actively protected, which means that the catastrophic loss of its forest habitat in Borneo which is projected to continue, will inevitably lead to further loss of orangutans in areas where we can’t fully protect them. Accordingly, the IUCN are considering changing their status to the more alarming critically endangered. About 85-90% of wild Bornean orangutans are found outside conservation areas. Whilst designated conservation areas (like national parks or wildlife reserves) generally have park rangers to patrol and protect the conservation area, the majority of orangutans live in forests that have no management authority assigned to protect them and their habitat. 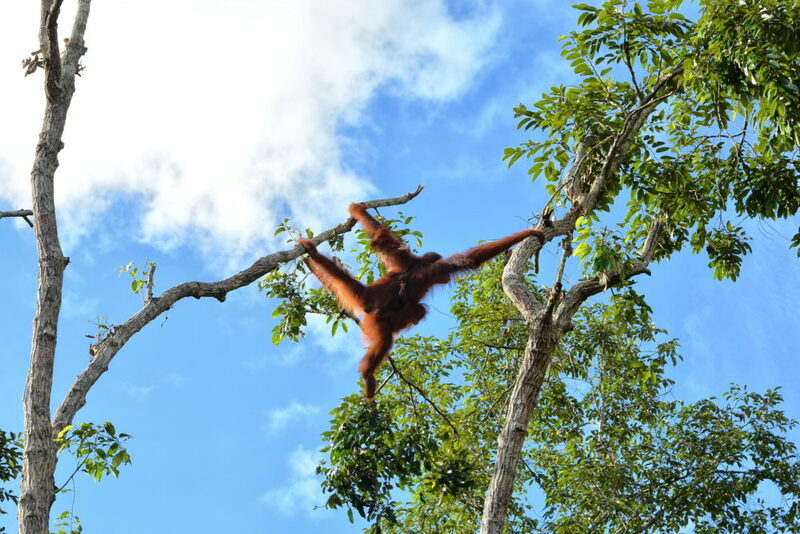 In Indonesian Borneo, which is where the majority of Bornean orang-utans are found, most orangutans live in forests inside industrial concessions. These are mainly timber concessions inside production forests and also residual forests in oil palm concessions. About half the total orangutan population in Borneo is found in the Indonesian province of Central Kalimantan. Here, Conservation Forests account for only 10% of the total State Forest; whilst Production Forests account for 63% and Protection Forests (which are generally not actively managed), 9%. The greatest threat to the Bornean orangutan population is currently the loss and degradation of its forest habitat, especially as a result of the conversion of forests for oil palm development. In recent years, the Orangutan Foundation has had to rescue a constant flow of orangutans from these areas, often from the last tree standing. The Government of Indonesia has recently embarked on a long-term programme to develop a system of Forest Management Units (FMU’s) to manage the state forest land, especially forests designated as Production Forest and Protection Forest. Unfortunately the FMU’s whose areas contains orangutan habitat generally have no experience of managing endangered ape populations. Consequently, our urgent conservation priority is to support these units understand how to help the orangutans best. This involves running capacity building programmes to help them manage endangered ape populations within designated FMU management areas. The team will help the units to develop formal relationships with government agents and local bodies. They will train up staff so they know how to identify orangutan field signs and monitor them effectively. And these teams will also be supported technically so they can create management plans for each area that take into account what is best practice for these endangered great apes.